Do you like to win prizes? Maya and Pierson sure do. 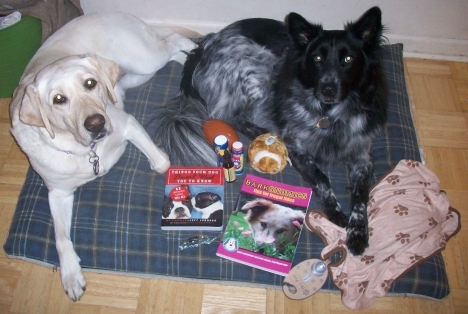 In fact, they recently won some great gifts from Blog Paws! Maya & Pierson aren’t just all about getting stuff. They like to help give stuff away too. So earlier this month, they convinced me that I should do another giveaway for a free dog car harness. After all, it’s important that dogs ride safe in the car too. They are family. That contest is still open until the end of the month. It was posted on my Pet Auto Safety Blog on February 5th, 2013 and is open until the end of the month. Another contest just started today on that blog. It is a contest from Subaru and the prize is a $350 Visa gift card (1st place) and a $150 Visa gift card (2nd place). You must check this out! I am ineligible but perhaps one of my doggy friends can win! 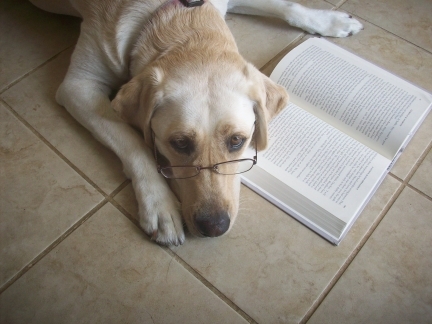 How did Maya & Pierson win a gift from Blog Paws? I volunteered to help promote the Super Dog Sunday. This even helped to raise funds for the Petfinder Foundation. Little did I know that when I volunteered that I would be entered into a drawing. It was a great surprise! Another great surprise from volunteering to help Super Dog Sunday is that Maya and Pierson get to try out a new product called Kumfy Koatz. And guess what?!? I also get to give one away!!! So visit my Pet Auto Safety Blog. Find and enter the dog seat belt giveaway contest posted on February 5th, the Subaru gift card contest posted today (February 18th), and keep an eye out for the Kumfy Koatz contest. I will post some photos on Wednesday for the Wordless Wednesday. Then I will open the contest entry for the Kumfy Koatz on Friday, February 22nd. Wow! That’s a lot of stuff. Maya & Pierson wish you luck!